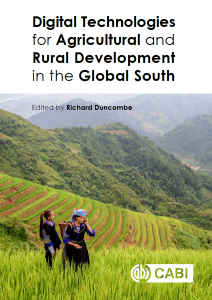 Global Development Institute researcher Dr Richard Duncombe is the editor of a new book sharing research and practice on current trends in digital technology for agricultural and rural development in the Global South. The population of the Global South is growing rapidly. As populations grow so do requirements for food and nutrition. Improvements in agricultural productivity and sustainability are essential conditions for development to take place, in this respect. Some regions of the Global South have seen greater success than others in terms of agricultural growth. Low agricultural productivity in the Global South can be attributed to lack of knowledge of up-to-date technologies and practices, as well as issues such as climate change. In recent years, to face these challenges, there has been growing activity around use of digital technology for agricultural and rural development in the Global South, to address knowledge gaps, and to establish the building blocks for new rural services. The aim of this book, Digital Technology For Agricultural and Rural Development in the Global South, is to share research and practice on current trends in digital technology for agricultural and rural development in the Global South: specifically to bring together the perspectives of academic researchers from diverse disciplines with those of practitioners with experience of implementing mobile applications and agricultural information systems in differing country contexts. Views from diverse academic disciplines as well as practitioners with experience of implementing mobile applications and agriculture information systems in differing country contexts. Case studies from a range of developing countries and information from across the public and private sector. A set of practitioner guidelines for successful implementation of digital technologies.With contributions reaching beyond just a technological perspective, the book also provides a consideration of social and cultural factors and new forms of organization and institutional change in agricultural and rural settings. An invaluable read for researchers in international development, socio-economics and agriculture, it forms a useful resource for practitioners working in the area.